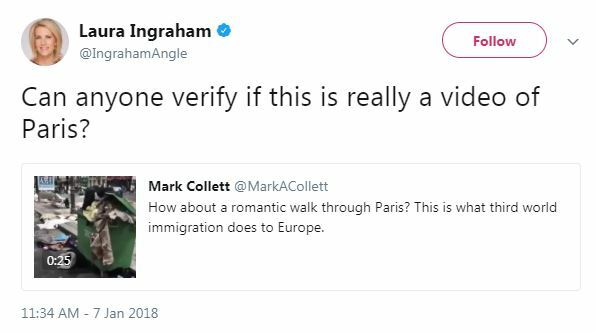 The person Ingraham retweeted, Mark Collett, is a former chairman  of the youth division of the British National Party (BNP,) a far-right  political organization in the United Kingdom. Collett was eventually dismissed from the BNP and arrested for death threats  against his political rival, who was then the BNP’s leader. Collett has repeatedly collaborated  with and received a book endorsement  from former KKK leader and radio host David Duke. Collett once said  that he admired Adolf Hitler, and has said  that he considered AIDS a “friendly disease because blacks, drug users and gays have it.” He has also  called asylum seekers “cockroaches” and accused Asian men of “go[ing] straight to the whites 'cos they are trying to destroy us and they are the racists.” Collett also campaigned in support of Brexit  with his girlfriend, who has multiple Nazi tattoos. Ingraham’s retweeting of a neo-Nazi comes about two weeks after her primetime Fox News colleague, Tucker Carlson, approvingly  tweeted  an article from a white supremacist radio show that called the Holocaust “the biggest hoax of the 20th century .” Carlson “apologize[d] ” for the tweet without acknowledging he linked to a white supremacist account.